Description - This pigeon sized bird, the belted kingfisher is blue-grey above and white below with a bushy crest and dagger-like bill. The male has a blue-grey breast band; the female is similar but also has a chestnut belly band. The call is a loud, penetrating rattle. 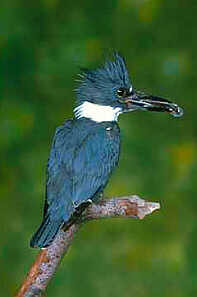 Distribution - The belted kingfisher breeds from Alaska east across southern Canada and throughout most of the U.S.A. They winter on the Pacific coast north to Alaska. They inhabit rivers, lakes and saltwater estuaries. Look for the image of the Belted Kingfisher on the back of Canada's five dollar bill. Biology -The belted kingfisher perches conspicuously on a tree limb over a river or lake while searching for fish; they sometimes feed on lizards and insects. When flying from one perch to another they often fly with uneven wing beats, uttering it's rattling call as it goes. The nest is at the end of an unlined chamber dug in a sand or gravel bank where 5-8 white eggs are laid.